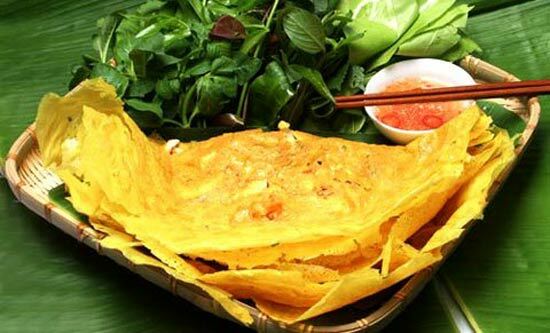 “Banh xeo” is Vietnamese style crepe with whole shrimp, thinly sliced pork and bean sprouts. Like the salad roll, the “banh xeo” is a do-it-yourself dish that involves the messy but delicious process of wrapping the crepe in lettuce with cilantro and basil. Though the filling might fall out on your table, you will be completely lost in the crispy, warm combination of lettuce and crepe, and the attentive staff will happily clean up after you. “Banh xeo” is prepared differently throughout the country. Tourists traveling about in viet nam are sure to encounter a different recipe, and sometimes even a different name, for “banh xeo” depending on which region and province they are visiting. These are a pale yellow spicey Vietnamese style crepe. One piece on the bottom, and another on top encase what is usually a salad consisting of been sprouts, prawns, boiled pork, taro and carrot. Drenched in fish sauce, and you have a deliciously messy slice of fine pleasure. The dish is round, and you cut it into slices, like a pizza, so it resembles a triangle on the main platter, but usually by the time it arrives on your plate, it could resemble anything really. In the Southern region, the “banh xeo” is the size of a large dish and yellow in color due to the employment of turmeric powder. The Southern people always add coconut milk to the rice flour to make the crepe extra delicious. The crepe is stuffed with bean sprouts, mung beans, shrimp and pork. A sweet and sour fish sauce and fresh vegetables are used as accompaniments. In the Central region, “banh xeo” cooks make a smaller crepe that is white in color. In Hue, the crepes are called “banh khoai”, which is similar to “banh xeo”, but smaller in size and stuffed with fennel, sour star fruit, green banana and a thick soy sauce. In addition to selling the crepes to patrons, vendors also prepare them en masse for birthday parties and festivals. Northern preparations of “banh xeo” are similar to the ones down south, but include special fillings like slices of Indian taro and manioc. In some regions, “banh xeo” is prepared thick, but Southern crepes are characteristically thin, crispy and served fresh out of the frying pan. The secret to extra-thin crepes is a deep frying pan and a quick wrist to coat the frying pan with the batter before it starts to set. Where to enjoy “banh xeo”? In hanoi, there are a lot of addresses for you to enjoy “banh xeo”, such as 22 Hang Bo Street, “Quan Ngon” restaurant at 12 Phan Boi Chau Street or “Chin Tham” restaurant on Thai Ha Street. In HCMC, southern-style “banh xeo” can be found at Banh Xeo 46A on Dinh Cong Trang Street, District 1 or An la ghien Restaurant at 54A Nguyen Van Troi Street, Ward 15, Phu Nhuan District. Those seeking a meatless version of “banh xeo” can find them at vegetarian restaurants on An Lac Restaurant, 175/15 Pham Ngu Lao Street, District 1, and Thien Nguyen Restaurant, 174 Calmete street, District 1. Maybe like: The beauty of Ham Rong Mountain in sa pa, Lao Cai.